High strength, tough and high heat check resistance hot work die steel. 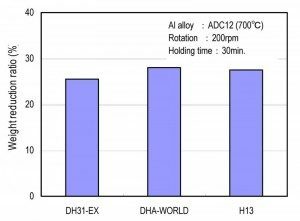 DH31-EX is a hot working die steel with the best balance of strength and toughness showing the comparable softening resistance to SKD7 and twice hardenability as that of SKD61. High hardenability: High toughness is obtained even in large size die. 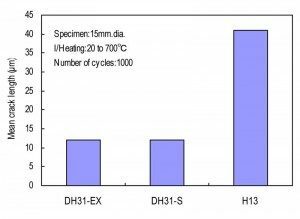 High toughness: DH31-EX has higher toughness than that of SKD61. 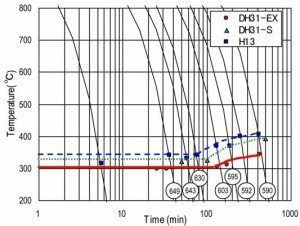 High heat check resistance: Excellent heat check resistance leads to longer life. Take a look at DH31-EX NADCA Certification here.